IVECO and CIFA broke new ground on IVECO’s Diesel-free/Low Emissions Area stand at IAA Commercial Vehicles (IAA) 2018 exhibition by presenting the first vocation-specific 400 hp Stralis X-WAY Natural Power truck powered by a compressed natural gas (CNG) engine and equipped with a CIFA electric concrete mixer. The combination offers a 100% zero Diesel, zero oil solution. The vehicle runs on bioCNG, a renewable natural gas, and is equipped with the Energya hybrid plug-in concrete mixer developed by CIFA. The mixer is operated by an electric engine powered by a lithium battery. It also features a Kinetic Energy Recovery System that recovers the truck’s energy when it is decelerating. The bioCNG engine of the Stralis X-Way NP, coupled with the electric engine of the Energya concrete mixer deliver extremely low CO2 emissions and extra-quiet operation. The truck is a Stralis X-WAY NP developed specifically for concrete mixer applications to deliver the best payload in the industry with best-in-class kerb weight. Equipped with the CIFA Energya hybrid plug-in concrete mixer and running on bioCNG, this vehicle demonstrates IVECO’s capabilities to deliver 100% diesel-free transport solutions. 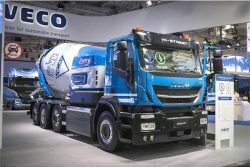 During the IAA exhibition, IVECO held an official ceremony on its stand for the handover of the first five Stralis X-WAY NP electric concrete mixer trucks to representatives of the leading European logistics operator Transports Perrenot.